I work two jobs so I treasure the one day I get off a week. Lately, it has been Mondays. Believe it or not, I actually look forward to Mondays. For 10 years, I worked 7 days a week. It’s nice to be in a place where I don’t have to work every day. I’ve also learned I can break things up like just mopping one floor this week and another the following week. It is also the one day of the week I can cook lots of new recipes. This is actually one I tried today. It did its job in the fridge while I washed 10 loads of laundry. 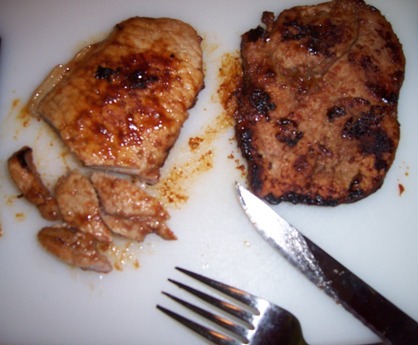 Mix ingredients in a baggie and add pork chops. Marinade in the fridge for 30 minutes. Cook until meat is no longer pink. In September, I took a job as the Volunteer Services Manager at Harvesters – The Community Food Network. The position was the perfect match for me – volunteerism and food. Plus, as a donor and episodic volunteer I knew just how great an organization Harvesters was…or so I thought. I quickly learned that this organization was even better than I realized. Harvesters is the Kansas City area’s only regional food bank. The difference between a food bank and a pantry is something most people don’t know. Each week, Harvesters processes enough food to feed 66,000 people in our 26 country service area. They work with a network of over 620 food pantries, kitchens, and shelters to get the food to where people live. From some of the rural counties we serve, this might even be a few hours from our Topeka facility. Harvesters operates like a business – quickly processing food orders placed online like Amazon might do. The high level accountability and relationship building with local businesses mean that 97% of the food and funds received go right back out to the people served by our community partners. I’ve worked for a lot of great nonprofits by nobody with that little of overhead expenses. I, like so many of you may be, was shocked by just how many people are food insecure. One in six people in our country are hungry. That means, probably someone you know has or currently is struggling to eat. And for some reason, many people have this perception that if someone isn’t skinny or displaying a bloated stomach than they aren’t really hunger. In fact, major health issues like obesity and diabetes are often the result of food insecurity. When people are limited on funds, they purchase unhealthy, cheap foods that fill up their bellies. Since 1980, the cost of processed foods has decreased by 40% while the cost of healthy foods like fresh vegetables/fruits and lean meats has increase by 40%. Are you as surprised as I am by this? What is even sadder is that one in three kids born in the year 2000 will develop Type II Diabetes (the kind that is caused by what you eat and limited exercise). One of the coolest things Harvesters does to help address these issues is that it provides nutrition education. We have a whole team of people who spend their days testing recipes and teaching nutrition classes. These dishes are selected for their healthy qualities, tantalizing taste, cost, and ease in preparation. I have to say, I haven’t tasted a recipe yet that I haven’t liked – and you know veggies aren’t my favorite. In addition to teaching classes for both children and adults, we also share these recipes at our Mobile Food Pantries. Each month, Harvesters distribute a ½ million pounds of fresh produce. Nutritious recipes help people utilize the healthy fruits and vegetables they receive. 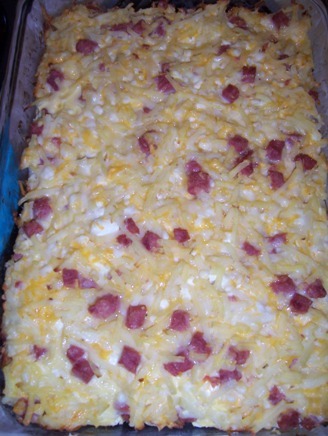 Check out this Kids in the Kitchen recipe for a delicious breakfast/dessert favorite. Combine oats, honey, and oil. Heat skillet to medium temp and add mixture. Stir frequently for 8-10 minutes until golden brown (but don’t burn). 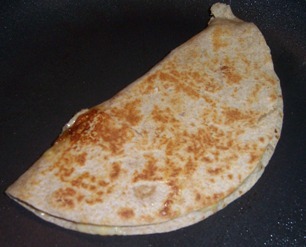 Immediately remove from skillet and cool on an aluminum foil lined baking sheet for 10 minutes. Then, break into clumps. Zest lemon and add with cinnamon to yogurt. In a separate bowl, mash together bananas and berries. 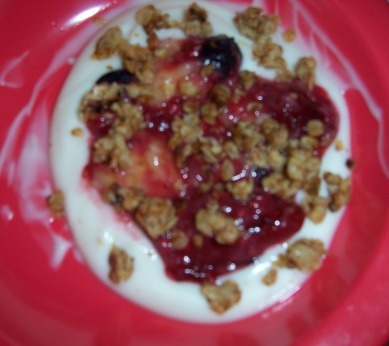 Dish up ¼ c. yogurt, ¼ c. fruit, and top with 1/8 c. granola. 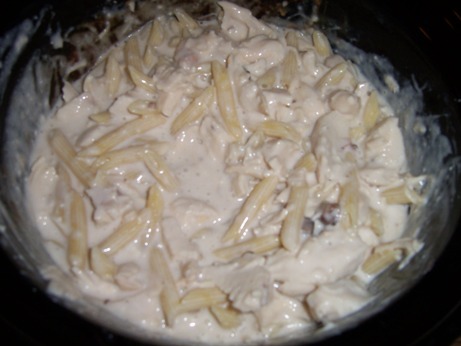 Nutritional Information: (Serves 12) 178 calories, 6 g. protein, 27 g. carbs, 3 g. fiber, and 22mg sodium. I made it with lemon juice and no zest. I microwaved the berries for a few minutes to thaw. Leftover yogurts were refrigerated. Greek yogurt is expensive so I used low fat vanilla yogurt. Greek yogurt is $1.15 per container. Each regular yogurt was $.40 per container. Just note it might change your nutritional information.